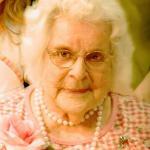 Norma I. Evans, age 105, formerly of Salamanca, NY died on Saturday, April 6, 2019 at The Pines of Machias. Born August 13, 1913 in Ellicottville, NY, she was the daughter of the late Perry and Lola Grinols Evans. She was raised by her late brother and sister-in-law, Earl and Ellen Evans after her mother died in childbirth. Miss Evans was employed at the former Rathbun Molding Corp., of Salamanca, NY and the former Weston’s Cookie Factory, Salamanca, NY prior to her retirement. In her later years, she served as a caregiver for several families. She was a member of the First Congregational Church and the Ladies Auxiliary of the American Legion Hughes-Skiba Post #535. Surviving are: several nieces and nephews, including the Wayne Neudeck family, Delevan, NY. There will be no visitation. A funeral service will be held at the convenience of the family.